SCVHistory.com | Timeline: SCV History in The Signal, 1919-1999. "With this issue we unfurl the sails of The Newhall Signal upon the sea of journalism, and we hope that our efforts will be of service and benefit to the Newhall and Saugus valley area. In order to do our best, we must have the unbiased support and cooperation of the good citizens of these communities, and we are looking forward with perfect faith that this assistance will be extended to us. "The columns of this paper will be open for the discussion of any subject that will be of interest or benefit to the people of the Newhall and Saugus sections, but we reserve the privilege of eliminating anything that smacks of malice. "We should continually bear in mind that what tends to the true interest of one, helps others, and we must all work in harmony to promote the ongoing of our home section. "In conclusion, will say that we hope for the loyalty and help that is necessary to make this paper a credit to the town." So wrote The Signal's first editor, in the newspaper's very first issue, on Friday, Feb. 7, 1919, launching an 80-year tradition of vigilance and community journalism. Edward H. Brown's fledgling publication had a hometown feel from the start, carrying front-page items about parties, trips to the beach and residents' shopping excursions to Los Angeles and other points south. But even then, when Newhall was a sleepy rural town where talk at the corner store focused on a big crop or the proper way to breed chickens, there was a hint of the growth that would occur in the latter half of the century. When The Newhall Signal made its debut, a one-year subscription cost $2. There were no screaming headlines, and one could find unlabeled opinion in almost every news story. Among the tidbits in the first issue of The Signal: "There have been several cases of the 'flu' here, but they are all up and around now." "Mr. Buttler of the Buttler Grocery was in Los Angeles the first of the week buying goods." "Mr. Bricker, of the Bricker Grocery, was in San Fernando on Monday. He is kept quite busy with his truck business." "The Sterling Borax Mine, near Lang, is working full time, three sets of miners working eight hours each, consequently the mine never stops working." The Signal's first big story was that of the destruction of the Swall hotel, a landmark structure and one of the newspaper's regular advertisers. On Friday, March 21, 1919, the headline screamed: "AN OLD LAND MARK BURNS DOWN TUESDAY." The Signal in its first year still had a post-war feel, carrying the occasional letter from one of "our boys" still stationed in Europe after serving in World War I. Brown scribed sarcastically in the Feb. 28 issue, "The Germans still cherish hopes that America will stand their friend at the peace table. The sinking of the Lusitania and the bombing of American Red Cross hospitals are, of course, strong and convincing reasons why we should feel kindly toward them." Far from the thriving region it has become, the valley in 1919 was an agricultural community where everyone knew everyone else by name. A wedding announcement would refer to the bride as "one of our most outstanding girls." Historian A.B. Perkins described the 1920s as the decade when nothing much happened outside of the St. Francis Dam disaster and the Buffalo Tom Vernon train robbery. The Signal was still in its infancy, getting used to its wings and townspeople. Spaces between stories were often filled with large ads reading, "Boost Newhall." Editorials referred to people who didn't get involved in their community as "flat tires." Mastheads carried slogans like, "The Newspaper With A Backbone," and "For Each Other, Not Against Each Other." They sold all kinds of things at The Signal office, such as Brunswick records, fuse plugs, note pads, school pads, cards and "No Shooting or Hunting" signs. The Signal office was the place where people registered to vote. It was the area's printing shop and was pretty proud of its work, according to an ad from September, 1924: "WANTED - Your Printing Business. If We Can't Please You, DON'T COME AGAIN!" Doelle had published a few issues of a little paper called the "Saugus Enterprise." No copies are known to exist today. When The Signal bought him out, this paper's full name became "The Newhall Signal and Saugus Enterprise." Blanche Brown's newspaper was full of news; the society column ran on the front page, and Thornton, whose "real" job was with the Forest Service, wrote several columns and poems. In addition, they occasionally ran a column called "Peanut Pietro," written totally in Mexican slang. 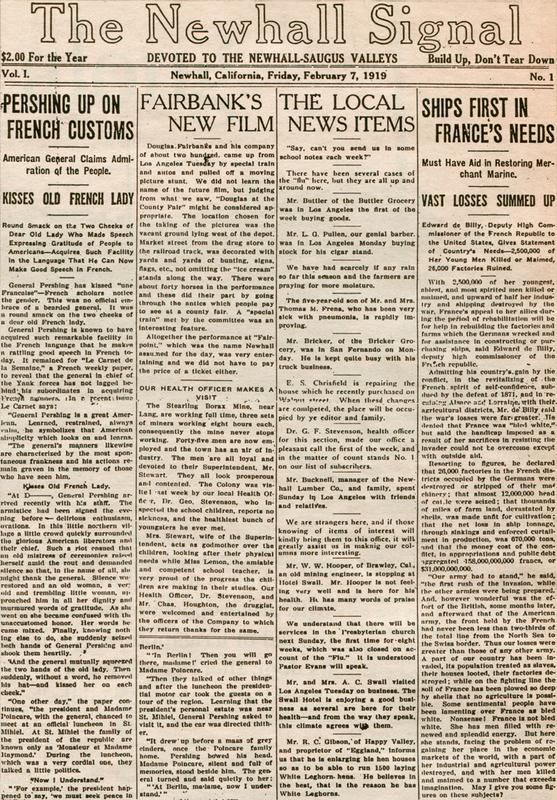 In January, 1925, while Blanche still owned the paper, Doelle took over as lessee and editor. He filled the pages with graphics, poetry and fanciful commentary. He was a colorful editorialist. In June 1925, Doelle was out and A.B. "Dad" Thatcher, was hired as editor and, by year's end, publisher. Thatcher changed the paper's whole look. Doelle's plethora of poems disappeared. In their place, O. Lawrence Hawthorne appeared under the masthead, complete with artwork. Page one carried news, society items, obituaries and, sometimes, sports. Local news jumped to the back page. Inside pages were filled with wire reports, items on cooking, housekeeping, agricultural or historic features and serialized stories. The pattern continued into the 1930s. The Signal was published weekly, on Fridays at first, changing to Thursdays in 1924. The paper strongly favored the creation of a chamber of commerce, proposing in 1919 and again in 1922 that one be formed. An estimated that 2,200 cars tooled through town every day. Comics first appeared in The Signal on Nov. 18, 1926. A.B. Perkins and his wife actively campaigned to build a community high school and managed to get a bond measure on the ballot. They personally lobbied the Los Angeles County Board of Education to form a district to serve the 150-plus students who then commuted to San Fernando High School. By far the biggest news was the destruction of the St. Francis Dam on March 12, 1928. At three minutes before midnight the dam collapsed, sending a 180-foot-high wall of water crashing down San Francisquito Canyon through Castaic Junction, past Piru and Fillmore and eventually into the Pacific Ocean near Ventura. The violent floodwaters carved a swath of death through the Little Santa Clara River Valley and left some 470 bodies in its wake. It was the second-worst disaster in California history in terms of lives lost — second only to the great San Francisco fire and earthquake of 1906. The decade opened with A.B. Thatcher at the helm of The Signal. The front page was peppered with church news, school news, Kiwanis news, births, deaths, women's club news, lost dogs, weddings and various other social goings-on. There were regular announcements of dances at the "Saugus clubhouse." Newhall School news was divided into grade level, with students submitting information after grade one. California news and ranch news could be found on the inside pages. The Depression took its toll on the nation, but mentions of "hard times" in The Signal of the early 1930s were scarce. Rather, the paper reported that the times were hopeful and the people resourceful. Most Signal news centered around home, church and family. Taking a peek into a 1930s kitchen window, one would find a wood-burning stove or one of those newfangled gas varieties that were advertised weekly. The wood stove gave "considerable heat, and [was] desirable in the spring or fall when the mornings and evenings are chilly and the middle of the day almost hot." The Bank of Italy on San Fernando Road was the only bank in town. It became the Bank of America in 1931. "Dad" Thatcher ran an article from American Banker's Magazine explaining that advertising was the "moral duty" of every businessman. Patriotism ran high. In 1934, community leaders promised that the local Fourth of July celebration would be a "a wham, a Zow, and likewise a Knockout!" By mid-decade, people were streaming into California in record numbers and The Signal's world-consciousness was expanding. Local news still ran on the front page, but the interior pages often carried wire stories and photos of Japan, China, Hitler, Mussolini and Stalin. Ranch news disappeared altogether. In July 1938, The Signal took on a decidedly different look. The rather abrupt change was the result of a change in owners as Blanche Brown sold the paper to F.W. Trueblood. Thatcher retired and church news moved to the back pages. Local attention turned to the plight of the valley's high school students and the lengths they had to go to for an education. The exciting news was that a new high school was on the horizon, with the 7th and 8th grades taking on the status of a junior high. Overall, The Signal was a reflection of an optimistic community of good-hearted townsfolk. The Santa Clarita Valley awoke to fog on New Year's Day, 1940. The future bustling areas of Newhall, Saugus and Canyon Country were still merely hamlets of homes tucked together, collectively called Soledad Township, with gas and electric lights cutting through the fog that had blanketed the valley for the past week. People looked forward to the end of the Depression. Franklin Delano Roosevelt was president, tires cost $3 to $7 each, and you could buy only American cars. A war was waged in newspaper advertisements over the benefits of electric stoves versus gas appliances. Talk centered around the need for a local high school. At the time, teen-agers were still being bused or otherwise driven "over the hill" to San Fernando High. Signal editorials supported the creation of a new school and district. A drastic change took place between the covers of The Signal — not in the reporting, but in the advertising. Suddenly, gas, electric and telephone companies asked people to curtail the use of their services. Previously, utilities begged people to use more gas and electricity and to make more phone calls. World War II dominated most people's thoughts in the early '40s. By the time Fred returned in 1944, peace was in sight. Ads encouraged women to "dream of that brand new kitchen you can have after the war." Electric lights illuminated many homes as the 10,000 residents of the Little Santa Clara River Valley counted down to midnight on December 31, 1949. Newhall had a national rodeo roping champion, high school sports teams called the Injuns, a Fourth of July parade at "Slippery Gulch" (aka Monogram Movie Ranch in Placerita Canyon), a two-headed calf and a champion chinchilla named Mike. The decade would bring tail fins, sonic booms and an inkling of the growth to come, as The Newhall Land and Farming Company unveiled its ambitious plans for a new community to be called Valencia. The Signal of the early 1950s had already established a few trademarks. Owner-editor-publisher Fred Trueblood's "Signal Tower" column ran each week on the front page, while his editorials took government officials to task for everything from letting the military "go to pot" after the war to hauling Los Angeles trash to the SCV and feeding it to hogs. The Signal print shop moved from its 32-year home at 636 Spruce Street, where Signal readers had been told to kick the door a few times if it should happen to stick. A big piece of valley history made the news in 1950 when the future of the William S. Hart estate was decided in court. Hart, the famed cowboy star of the silver screen, had left his Horseshoe Ranch to the County of Los Angeles for preservation as a public park. Not all of Hart's family members were pleased, but in the end the county won. The Signal printed a big program announcing Fourth of July festivities at Slippery Gulch, which would come to be known as Melody Ranch after "Singing Cowboy" Gene Autry purchased the old Monogram Ranch in 1952. In that year, The Signal's July 4 program, the "Slippery Gulch Gazette," proclaimed that the valley's first "real" fireworks show would be held at Hart High. Then as now, The Signal was the hometown paper of "Newhall and vicinity" — a portion of which would soon get a new name. In 1957 the top of The Signal blared, "NEWHALL RANCH REVEALS VAST DEVELOPMENT PLAN FOR FUTURE." The plan would ultimately transform "Newhall and vicinity" from a small town to a thriving modern suburb. Every decade has its particular signature. For the little Santa Clarita Valley, the indelible, burning brand of the 1960s came in the person of pirate. His wolfish grin and his seeming ability to inhale all the air out of a room disarmed the meek and mighty alike. He was Scott Newhall. For 40 years, The Signal had been the equivalent of a family scrapbook. It had been a mom-and-pop outfit with panache under Trueblood. The paper had made him the voice and soul of Santa Clarita. The Signal resided just east of San Fernando Road, south of Market Street, wedged between the old post office and a pool hall called the Happy Valley Roundup Club. The Signal was both print shop and railroad freight office. Life was bucolic. Everyone still knew everyone else. Major community events included the world-famous rodeo and the annual "Placeritos Days" celebration, commemorating the state's first documented discovery of gold in Placerita Canyon (1842). Scott Newhall introduced what you might call the "modern" Signal on Jan. 9, 1964. For the first time the paper carried a screaming eagle on its masthead with "Vigilance Forever" as its motto. Newhall had been editor of the San Francisco Chronicle at a time when its rival, William Randolph Hearst's San Francisco Examiner, dominated that city's subscriber base. Before he left the Chronicle, Newhall had gone to war with Hearst — and won. Newhall took the Chronicle from number two in circulation to number one, much to Hearst's chagrin. "Scotty," as his friends knew him, published the first Sunday edition of The Signal on Dec. 5, 1965. No longer was The Signal just a weekly. The following year the paper expanded to three times a week, publishing on Monday, Wednesday and Friday. Scott was a biting editorialist whose above-the-masthead editorials lambasted presidents and popes alike. No one was safe from his rapier pen (actually his 1941 Royal typewriter) — not the local county supervisor, not the school board, not even the "naked cows" of the Newhall pasture. The flamboyant writing style was one of several techniques he applied to boost readership. In 1965, readership doubled, and in 1966 it doubled again. Meanwhile, the new place called Valencia was taking shape. More than a giant housing project, it was a monumental community master-planned by The Newhall Land and Farming Company — providing a tiny income to a certain newspaper publisher of the same last name. Every year, optimistic officials ritualistically declared that "by this time next year," the various communities of the Santa Clarita Valley would finally come together under the flag of cityhood. It didn't happen in the 1970s. The biggest political battle of the decade was the fight for home rule — not in the form of a city, but a county. Civic leaders fought to break away from Los Angeles County and establish "Canyon County," a large, triangular area of land with Acton, Newhall and Gorman at the corners. A small victory came in 1973 when the area was officially recognized by the county as the Santa Clarita Valley. Earlier, it had always been referred to as the "Newhall-Saugus area" or "Soledad Township." Canyon County formation initiatives went before Los Angeles County voters in 1976 and again in 1978. Both times, a majority within the proposed new county boundaries said "aye," but they were outnumbered by the voters in the rest of the county who feared a loss of revenue and said "nay." Magic Mountain opened on 200 acres of hillside west of Interstate 5 on Memorial Day weekend, 1971. Parking cost 50 cents and adult admission was $5. Newhall Land would own the park until June, 1979, when it sold it to Six Flags Corporation. Higher education got a boost in 1970 as COC opened its permanent campus and accepted 1,100 students. Meanwhile, CalArts opened a temporary campus in Burbank. The campus "came home to Valencia" the next year. Medical care took a quantum leap when the $9-million Henry Mayo Newhall Memorial Hospital opened on Aug. 3, 1975, with 100 beds. The Signal reported that there was "standing room only in the emergency room." Dramatic growth in housing was accompanied by an increase in home prices and fierce competition for new homes. When the Valencia Company held a particular lottery for 103 homes, many of the 700 hopefuls camped out overnight to secure a position at the front of the line. The environment became a central issue in 1972 as increased citizen participation caused the county to deny or delay several development projects. The Signal held steady at three days a week throughout the decade. A $500 "Mystery Face" contest in 1973 featured "disguised" photos of celebrities on the front page and clues about their identity. The "King of Kastaic" treasure hunt in 1974 was one of several Signal promotions featuring buried treasure. Growth. That's the story of the Santa Clarita Valley in the 1980s. The population exploded with a vengeance. No longer was the SCV a rural backwater. Before the decade was out, civic leaders would get their coveted home rule. The Newhalls — Scott and his wife, Ruth — had borrowed money in 1972 from Charles Morris, owner of a small chain of newspapers in the South, to pay off their 1963 purchase loan. The new loan included an option for Morris to buy The Signal after six years. In 1978 the Newhalls wanted to pay off Morris, but he chose to exercise his purchase option. The Newhalls stayed on to run the paper for another 10 years — as employees of Morris Newspaper Corp. The Newhalls pushed hard for home rule throughout the 1980s. Given the political difficulties of county formation, the effort shifted back to cityhood. The city formation effort gained strength when voters learned that they were sending roughly $4 million more in tax dollars to downtown Los Angeles each year than they were getting back in services. By 1987 the cityhood drive was in high gear. Prior to election day, county officials stripped the boundaries of the proposed city from 90 square acres to less than 40. But this time, the effort would succeed. On Nov. 3, voters within the proposed city gave thumbs-up to cityhood. (The cityhood vote did not have to go before all voters in the county.) Local citizens simultaneously elected their first city council: businessman and school board member Howard P. "Buck" McKeon, book store owner and civic activist Jan Heidt, chamber of commerce executive director Jo Anne Darcy, high school teacher and COC board member Carl Boyer III, and retired fire fighter Dennis Koontz. For the first time, the people of "Santa Clarita" had a local government that could spend local tax dollars on local services. The 1980s would see The Signal get more and more involved in ever-increasing community happenings. The Signal carried a "Voice of the Valley" page early in the decade with contributions from various valley residents, including prose, poetry, photographs, drawings and cartoons. As new subdivisions sprouted and the valley's population soared, residents took a greater interest in preserving SCV history. In 1980 a huge, community-wide fund raising drive was organized to save the Saugus Train Station, which was slated for demolition. School children pitched in pennies to move the station two miles down San Fernando Road, to its present location at Heritage Junction Historic Park. Meanwhile, downtown Newhall merchants established the Walk of Western Stars (initially Western Walk of Fame) to salute local Western celebrities, beginning in 1981 with Gene Autry, Tom Mix and William S. Hart. The Signal made strides of its own. In 1986 it moved from its longtime downtown Newhall location to the Morris Newspaper Corp.'s shiny new facility on Valencia's Creekside Road, where a major auto mall had taken root. A fine community must support its newspaper. And a fine newspaper must support its community. Newspapering is a pleasure and a privilege. Newspapering is the best and the brightest world of all." Two years later, the Newhall era ended as Scott, Ruth and Tony left The Signal. Scott and Ruth launched a short-lived, thrice-weekly paper called "The Citizen," while Tony took an editorial position at his parents' old stomping grounds — the San Francisco Chronicle. The Signal adopted a newer, more modern format and a new, aggressive reporting style under editor Chuck Cook. By the late 1980s the population had reached an estimated 140,000 people in the city of Santa Clarita alone. Official estimates predicted a 270,000 population by the year 2010. The Signal was well positioned to serve the growing community. Santa Clarita continued to grow as the 1990s dawned, but not as rapidly as it did in the 1980s. Real estate brokers and agents were hurting in the early part of the decade as a recession took hold, deflating home prices. Some developers were forced to auction homes. Yet growth remained the top local political issue, foreshadowing the resurgence of construction that would occur in the latter part of the 1990s. The decade began with the William S. Hart Union High School District announcing it was going to sue in an effort to force the County of Los Angeles to adhere to a court decision that would allow local governments to withhold development approvals for projects that would overburden schools. 1992 brought the long-awaited Valencia Town Center mall, developed by The Newhall Land and Farming Co. It was just the first piece of a "town center" commercial development that would continue into the new millennium. A proposed 190-million-ton capacity landfill in Elsmere Canyon remained a hot topic until 1995, when U.S. Rep. Howard P. "Buck" McKeon — who had been Santa Clarita's first mayor — succeeded in pushing through legislation with the help of Sen. Barbara Boxer that thwarted a land swap that was needed for the dump to be built. The quake would also spark one of the decade's fiercest political battles: Using earthquake damage as its impetus, the city launched a proposal for a $1.1 billion redevelopment plan that would finance a wide array of infrastructure improvements throughout the city. The plan was challenged in court by the Castaic Lake Water Agency which contended it stood to lose significant revenues and that the plan exceeded the scope of redevelopment law. The city ultimately abandoned the $1.1 billion proposal after the County of Los Angeles sided with the water agency in court. Throughout the 1990s, growth and related issues — traffic, school overcrowding, crime — dominated local political discourse. And although the city of Santa Clarita consistently rated in the nation's top five lowest-crime cities in America with populations over 100,000, there were signs that this was no sleepy hamlet anymore. In response to parental concerns about youth fashions of the day, the Hart High School District approved a mandatory school uniforms policy for La Mesa Junior High School seventh graders. Significant losses for the decade included the end of Saturday nigh racing at the Saugus Speedway. Racing was discontinued mid-season in 1995 as the track's owners cited structural problems with the grandstands. Significant gains for the community included the annual Cowboy Poetry and Music Festival, the brainchild of assistant city manager Ken Pulskamp. The idea was first scoffed at by many in the community — including The Signal — but in a few short years the event has placed Santa Clarita firmly on the Western circuit. The 1990s also saw the largest one-time event ever to grace the Little Santa Clara River Valley: In 1998, the PGA Tour paid the SCV a visit as Billy Mayfair beat out Tiger Woods to capture the Nissan Open Championship in a thrilling one-hole playoff at Valencia Country Club. For The Signal, the cavalcade into the 1990s saw the birth of new traditions in the personages of award-wining satirist John Boston and the legendary Randy Wicks. The man who needed only one name cut his eye teeth in the shadow of Scott Newhall at The Signal's old offices on 6th Street. With the chicanery of Newhall and a style all his own, Wicks' editorial cartoons added spice to the pages of The Signal for 16 years. His untimely death on Aug. 3, 1996 at the age of 41 left a chasm deeply felt throughout the valley. Hundreds of friends, family members, community leaders and admirers attended memorial services at his alma mater, California Institute of the Arts. Under the leadership of publisher Will Fleet and managing editor Tim Whyte, The Signal of the 1990s reflects its readers' growing awareness of the impact that local, regional and national issues can have on the residents of a community poised once again on the verge of major residential and commercial growth. And recognizing the changing ways in which readers expect to receive the news at the cusp of the millennium, online editor Leon Worden and IT manager Paul Sisson in June 1998 launched The-Signal.com, carrying news of the Santa Clarita Valley over the Internet 24 hours a day, seven days a week. Much has changed since Edward H. Brown put out the first edition of the Santa Clarita Valley's hometown newspaper in 1919. This once-peaceful little community, and its newspaper, have burgeoned into something our first settlers could not have imagined. ©The Signal. Used by permission.